I love sleep. Everyone loves sleep. But sometime's it's just so hard to make time for it. We lead busy lives, always trying to make the most of each day, whether it means staying up all night to finish a paper or trying to arrange your schedule to fit in some time with friends or even trying to make best use of your time by doing something that makes you happy. As we struggle to try and fit everything in our lives into this constraining 24 hours, often, one of the first things to go is sleep. They always say that you can't have it all, but you can at least try, starting with sleep. I know lots of people that stay up for long periods of time and complain about not getting enough sleep, but I personally get eight hours in every night. Because I believe that sleep is important and I make sure to make time for it. Here are my tips for how you can manage to get to bed earlier and catch a little more rest. This is essentially the most useful way that you can fit more sleep into your schedule, but it's also the one that people are most reluctant to do. You're not a kid anymore, I get it, you've grown out of bedtimes, but that doesn't mean that they still can't benefit you. I mentioned this on my post about how to minimize stress, because getting more sleep is not only good for the soul, but also for your body. Setting a bedtime is like setting a deadline. This is the time that I need to be in bed, which means that this is the time that everything needs to be done. Just like the way you would make sure to get a paper done in time for the due date, setting a bedtime allows you to have a designated time to get everything done by. Not only does it encourage you to be more productive, but by setting a bedtime, preferably the same time every day, you also create routine, allowing your body to get more used to the same sleeping time every day. This will make it easier for you to fall asleep at night and it will also make it easier for you to wake up in the morning, so you'll feel nice and refreshed. 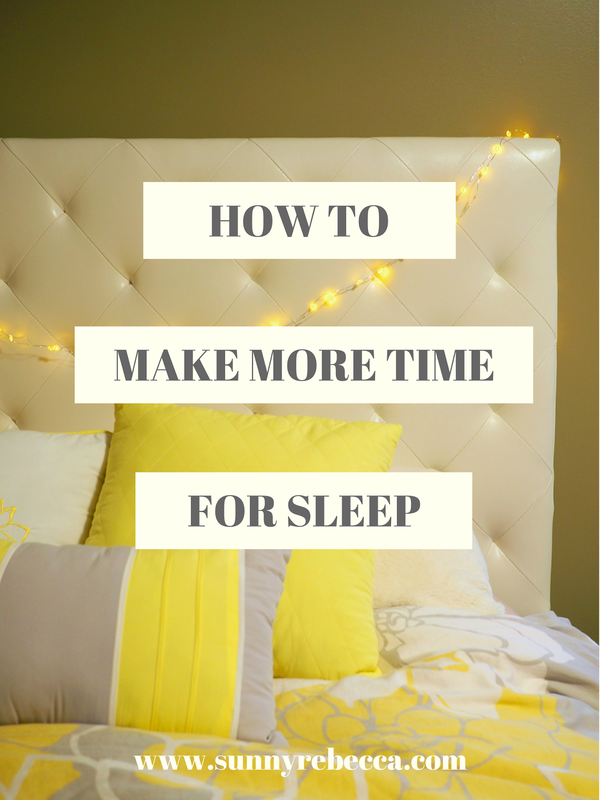 If you can't bring yourself to set a bedtime for yourself (although I highly suggest it) I have some other quick fixes that will help you make more time that you can use for sleep, don't you worry! For all you type-A people, I'm sure that you already do this, but if you're looking to save time, make a to-do list. If you're really in a time crunch, make a detailed one, with time frames to do everything you need to do. Recently, I've been trying to maximize my time and productivity, so I created a tentative schedule/to-do list for the day. I got everything done and got to sleep right on time. Your to-do list will encourage you to get things done quicker (because there's nothing like checking off a box on a to do list - so satisfying!) and be more productive, allowing you to finish everything earlier, then for you to go to sleep earlier. If you're doing a time-based list, you can put your designated bedtime in, which will remind you to keep on track and adhere to the given times of the schedule. I suggest a schedule if you're really running low on time and have a super packed schedule, but for a normal day, a to-do list will be more than enough. Braid your hair after taking a shower. This tip is very specific to people that take night showers. I always air dry my hair, but this tip could still work for people that blow dry their hair. If you take a shower at night, there are some times that you just really want to get to bed, but your hair is wet and you have to deal with blow drying it or air drying, which could cost your precious time. I like to braid my wet hair after I take a shower so that I can immediately go to sleep with them in, saving me time at night and allowing me to get to bed earlier. In addition, you can get more time to sleep in the morning, since when you wake up, your hair will be styled in neat waves, so you can cut down on hair styling time, which is especially useful for people who have high-maintenance hair routines. Start doing your work early. This means that the second you get home, you start doing everything and anything that you need to get done. Maybe that means working on your research paper, maybe that means cleaning the bathroom, whatever you do, start doing it early. The earlier you start, the earlier you will finish. I always do everything that I need to do as soon as possible so that the time before I go to bed is just for relaxing, making it very low-stress. In addition, if I don't get everything done by the time that I want to go to sleep, I can afford to stay up a little bit later, since there's not that much more to do. If I had started the same work later, then if it takes longer than expected, I'm forced to stay up a lot later and sleep less. By starting early, it allows you to finish things earlier, thus having time to sleep early as well, but if things take longer than expected, you don't have to go to bed too late. Prepare everything for the next day the night before. Okay, I get it, sometimes it's not so easy to get to bed early. However, you can still make more time for sleep by shaving off some prep time in the morning. Wherever you're going, prep your bag, materials, etc. for the next day the night before. Planning an outfit is also a great idea, but that's not always possible. I pack my bag and materials for wherever I'm going/whatever I'm doing the next day every night. As for clothing, I don't plan out an entire outfit, but the night before I think about what I'm going to wear the next day and have a general idea of it, allowing me to cut off some extra time in the morning and sleep a little bit longer. Use multi-tasking makeup products and cut unnecessary makeup. In the morning, makeup routines can be so long, especially if you're a makeup connoisseur. However, sometimes you just don't have the luxury to have time for a full face of makeup. For me, sleep is a lot more important. Cut down the time of your makeup routine by going for a low-maintenance look. Try and use makeup products that are multi-tasking so that you can just swipe them on and you're good to go. Some multi-tasking products include lip stains that also serve as cheek stains or a BB cream that can serve as foundation and moisturizer. Do you really need to waste that extra time curling your eyelashes? Instead, opt for a mascara with a curved brush, offering curling capabilities. Cut unnecessary steps in your makeup routine. Is it really necessary to bake your face every day? Minimize the intricacy of your makeup routine so that you can cut time in the morning, giving you more time to sleep in. This year I've been really trying to get more sleep, as it has such a positive impact on my week! I love your point about doing things earlier and committing to to-do lists. Sleep is so great and can really help with your overall well-being, which is why it's so important that we make time for it. Best of luck to you and your endeavors, hopefully they include a few more hours of shut-eye.